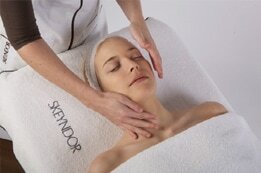 We offer Skeyndor skincare products, combining the goodness of nature with the wonders of science. We also customise spa and body treatments with Doterra certified pure therapeutic grade essential oils. Unique customer care: All our facials and body treatments begin with a foot spa ritual. Your feet are bathed in warm water, with bath salts and essential oils. Relax back and sip on a cup of locally produced herbal tea. Special offer: With every course treatment package purchased, receive your choice of either 2 free lash and brow maintenance (valued at $85) or 2 free sessions on the lymphatic therapy machine (valued at $85). Promotion: Clémence Organics Facial - $110 (limited time special price) - read more here. Our signature treatment is the ultimate indulgent experience. A full body scrub, followed by a hot bath or shower. Then a Swedish Aromatherapy massage, followed by one of our advance lifting and age-defying facials, including hand and head massage; and finally LED Light Therapy. This treatment lasts approx. 3 hours. This facial meets the needs of all skin types, especially sensitive and reactive, eliminating redness and tightness. Formulated from the renowned medicinal thermal spring water from Sailes-de-Bearn. This exclusive formulation will hydrate the skin’s deepest layers. It is now possible to get back that plump, dewy radiant skin. This powerful facial includes: anti-pollution filters, detoxifying elements, antioxidants, powerful oxygen supply, prebiotic action and environmental shields. Derma Peel is a Cosmeceutical grade peeling system and comes without harsh side-effects or down time. Treating blemishes, fine lines, scars and acne marks, achieving a more radiant, even and smoother complexion. An anti-bacterial action for treating pores, breakouts and acne. Increasing blood circulation and oxygenation of the tissues, accelerating the healing process. This action is also beneficial for ageing skin, firming and toning. This can be an add on to most facials. LED light therapy is completely pain-free, producing amazing results. LED will accelerate your treatment of acne, fine lines, wrinkles, pigmentation, acne, scarring and rosacea, promoting collagen production and will increase the rate of skin cell renewal.